The potentially hazardous asteroid (4179) Toutatis continues its trip around the Sun, bringing it in a few days to a minimum distance of 7 millions of km from our Planet. It is worth to underline that there is not any risk of collision with the Earth. This image was captured remotely using the PlaneWave 17 robotic unit part of the Virtual Telescope Project, with the system tracking the apparent motion of the target (at the imaging time the apparent motion was of 11″/min). It is part of a sequence showing the asteroid moving across the stars. 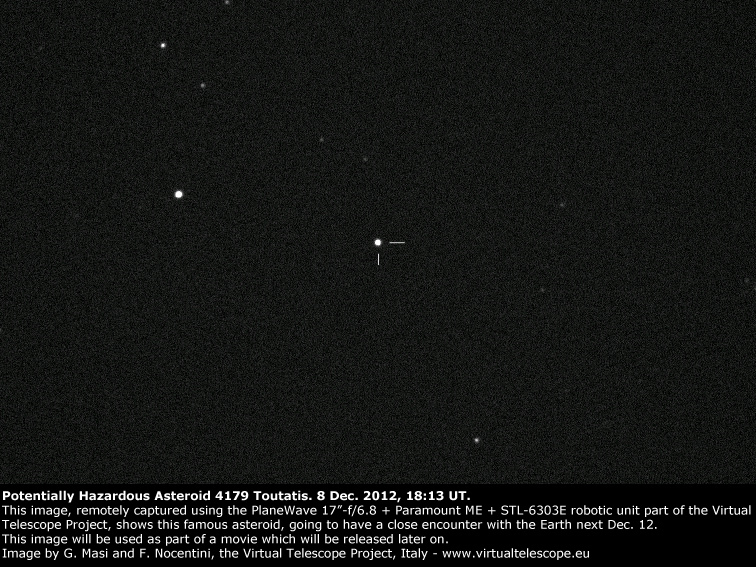 The Virtual Telescope planned a free, online session to show Toutatis in real time!